Our line of reusable bipolar forceps comes in a multitude of handle styles, lengths and tip sizes. Styles can be straight or bayonet and can vary in length from 3 ½ inches to 12 ½ inches. The forceps styles include NS and AURA™ non-stick, titanium and stainless steel. Additional optional features include insulated or uninsulated, and surface mounted or buried irrigation. The tip exposures range from 5.0mm to 10.0mm and the tips range in size from 0.1mm to 2.0mm. These forceps can be straight, angled, curved or coaptation design. Kirwan Surgical Products’ reusable straight bipolar forceps are available in several different styles to suit a multitude of microsurgical instrument needs. The Jewelers style bipolar forceps are offered in a variety of patterns. These forceps come in stainless steel, titanium, NS and AURA non-stick. Additional options include, straight, curved, Tenzel and angled. Adson bipolar forceps are available in stainless steel, NS and AURA non-stick. These forceps have 1.0mm tips and can be insulated or uninsulated. Iris bipolar forceps are available in stainless steel, NS and AURA non-stick. These forceps come standard with 0.4mm tips and can be straight or curved. Coaptation style bipolar forceps are available in stainless steel, NS and AURA non-stick. Patterns include standard jaws, extra fine jaws or Nadler style. Kirwan Surgical Products also offers Semkin, Cushing and Gerald straight bipolar forceps. These forceps come insulated and uninsulated and are available in stainless steel, NS and AURA non-stick technologies. Kirwan Surgical Products offers a vast assortment of reusable bayonet bipolar forceps in varying styles, lengths, tip sizes, and tip angles. Kirwan’s wide variety of bipolar bayonet forceps offers surgeons countless options to suit their specialty needs. The reusable Scoville-Greenwood bayonet bipolar forceps come insulated, uninsulated, irrigating, non-irrigating and are available in stainless steel, titanium, NS and AURA non-stick technologies. Kirwan Surgical Products’ reusable Tonsil bayonet bipolar forceps come insulated and are available in NS and AURA non-stick technologies. Kirwan Surgical Products’ reusable Cushing bayonet bipolar forceps come insulated and are available in 2.0mm and 0.7mm tip sizes. These forceps can be irrigating or non-irrigating and are offered in stainless steel, titanium, NS and AURA non-stick technologies. Reusable Gerald bayonet bipolar forceps come with 1.0mm tips and can be insulated, uninsulated, irrigating or non-irrigating. These forceps are offered in stainless steel, NS and AURA non-stick technologies. The reusable Hardy bayonet bipolar forceps come in two different lengths with stops. This product line offers a variety of tip sizes and tip shapes. Other options include insulated, uninsulated, irrigating, non-irrigating and are offered in stainless steel, titanium, NS and AURA non-stick technologies. Kirwan Surgical Products’ reusable Yasargil style bayonet bipolar forceps are available in three different lengths with four tip sizes. They can be insulated or uninsulated, irrigating or non-irrigating. These forceps are available in stainless steel, NS and AURA non-stick technologies. Kirwan’s reusable 3-Hole Yasargil style bayonet bipolar forceps come in six different lengths with five tip sizes in each length. The unique plateau tips have a reduced tip exposure allowing for delicate tissue coagulation. The 3-hole Yasargil style forceps also employs Kirwan’s patented AURA non-stick technology. The reusable Narrow Line style bayonet bipolar forceps have narrowed tines for improved access and visibility in small surgical sites; however, they maintain the feel and dissecting force of more robust forceps. These forceps employ Kirwan’s AURA non-stick technology and are available in four different lengths and seven tip sizes. Angled tips are available in the longer lengths. Kirwan Surgical Products’ reusable Malis style bayonet bipolar forceps with stops are available in four different tip sizes. These forceps come in titanium, NS and AURA non-stick with various options, including insulated, uninsulated, irrigating, non-irrigating, straight tips or angled up tips. A lightweight handle is also available in this style. The reusable Round Handle bayonet bipolar forceps are available in three different lengths with four tip sizes in each length. The forceps come with stops and are made with Kirwan’s AURA non-stick technology. Kirwan Surgical Products’ reusable MIS style bayonet bipolar forceps are specifically designed with parallel working lengths for small openings or to be used down a cannula. Complete with stops, they are available in three different lengths with two straight tip sizes and one angled up 45 degrees. These forceps employ Kirwan’s AURA non-stick technology. The reusable Reverse Action bayonet bipolar forceps are ideally suited for narrow surgical openings and aid in reducing hand fatigue. These forceps employ Kirwan’s AURA non-stick technology and are available in two different tip sizes. Kirwan Surgical Products offers the option of irrigation with many of their reusable bipolar forceps. Kirwan’s patented buried irrigation is included with the irrigating NS and AURA non-stick forceps. Recessing the irrigation tube inside the forceps tine allows for a narrower profile and increased visibility for the surgeon. All irrigating forceps have a standard shaver plug pin configuration and accept standard bipolar irrigating cords and tubing sets. Irrigation is offered on stainless steel, titanium, NS and AURA non-stick forceps. Kirwan offers a number of their reusable bayonet bipolar forceps with a European style bladed connector. Available handle styles with an EAU European bipolar connector include Scoville-Greenwood, Cushing, Hardy, Yasargil, 3-Hole Yasargil, and the Narrow Line series. Some of these style forceps are available in lightweight handle styles, tips angled up or down and with stops. These forceps all include AURA non-stick technology and are offered in various lengths and tip sizes. Reusable Titanium bipolar forceps are offered in both straight and bayonet styles with multiple lengths and tip sizes. Titanium forceps are lightweight and non-magnetic. They can be used in a variety of bipolar surgical indications to serve the surgeon’s microsurgical bipolar forceps needs. Kirwan Surgical also offers a selection of titanium forceps with its patented AURA non-stick technology. Kirwan’s line of reusable Overmolded bipolar forceps comes insulated in various lengths and tip sizes. These forceps are low cost and autoclavable. 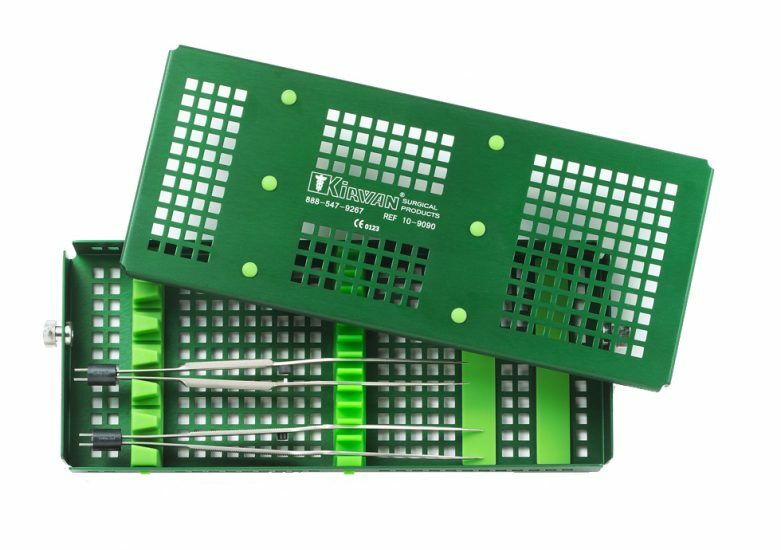 Available to fit two, six or twelve bayoneted bipolar forceps, Kirwan Surgical Products’ Sterilization Tray’s unique design properly positions and securely holds instruments during autoclaving and storage. Proper positioning and better handling ensures instruments will last longer and require less maintenance over time. Additional inserts and locks are also available for these trays.